This topic describes how to configure automated backups in Redis for Pivotal Cloud Foundry (PCF). If you have already set up BBR for your Pivotal Application Service (PAS) deployment, you might find it easier to use BBR to back up your on-demand Redis service instances, in addition to or instead of, using automated service backups. Note: Neither backup method backs up other manual changes made to service instances, either via SSH or with the redis client config command. For more information, see BOSH Backup and Restore (BBR) for On-Demand Redis for PCF. You can configure automatic backups for both on-demand and shared-VM plan types. Backups run on a configurable schedule. Every instance is backed up. The Redis broker state file is backed up. Data from Redis is flushed to disk before the backup is started by running a BGSAVE on each instance. 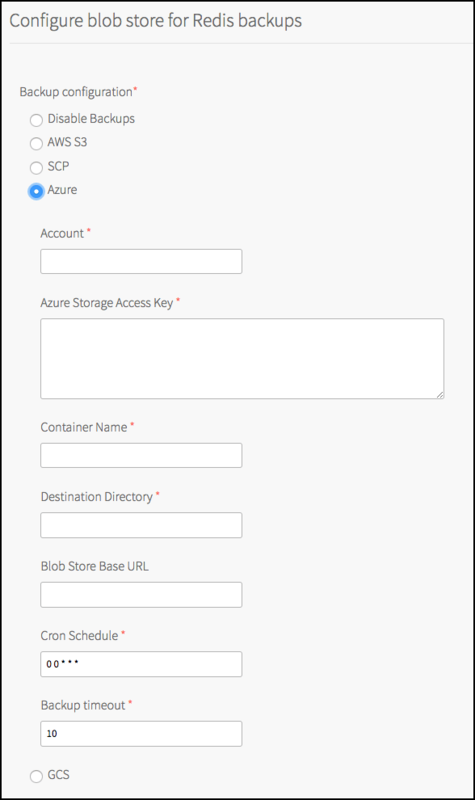 You can configure Amazon Web Services (AWS) S3, SCP, Azure, or Google Cloud Storage (GCS) as your destination. For shared-VM plans, backups are labeled with timestamp, instance GUID, and plan name. Files are stored by date. For on-demand plans, backups are labeled with timestamp and plan name. Files are stored by deployment, then date. For each backup artifact, Redis for PCF creates a file that contains the MD5 checksum for that artifact. This can be used to validate that the artifact is not corrupted. Redis for PCF automatically backs up databases to external storage. Option 1: Back Up with AWS: Redis for PCF runs an AWS S3 client that saves backups to an S3 bucket. 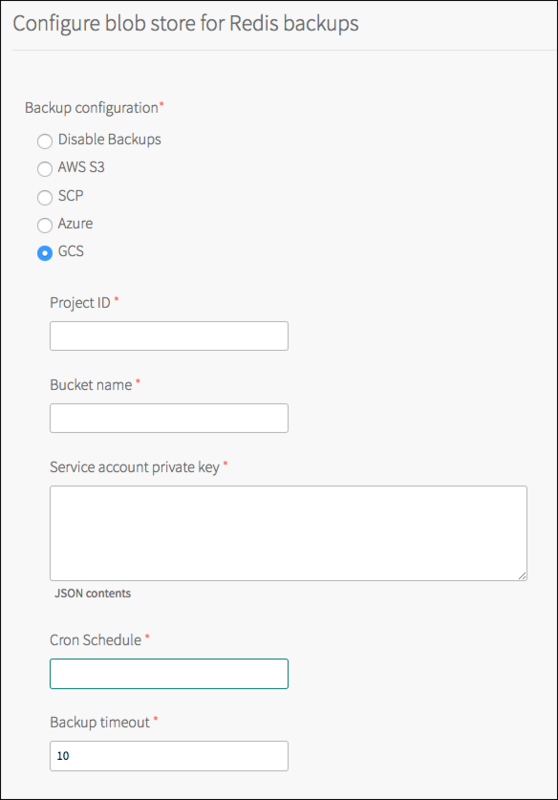 Option 2: Back Up with SCP: Redis for PCF runs an SCP command that secure-copies backups to a VM or physical machine operating outside of PCF. SCP stands for secure copy protocol, and offers a way to securely transfer files between two hosts. The operator provisions the backup machine separately from their PCF installation. This is the fastest option. Option 3: Back Up to GCS: Redis for PCF runs an GCS SDK that saves backups to an Google Cloud Storage bucket. Option 4: Back Up to Azure: Redis for PCF runs an Azure SDK that saves backups to an Azure storage account. When: Backups follow a schedule that you specify with a cron expression. For general information about cron, see package cron. To configure automated backups, follow the procedures below according to the option you choose for external storage. Redis for PCF accesses your S3 store through a user account. Pivotal recommends that this account be solely for Redis for PCF. You must apply a minimal policy that lets the user account upload backups to your S3 store. Navigate to the AWS Console and log in. Where MY-BUCKET-NAME is the name of your S3 bucket. If the S3 bucket does not already exist, add s3:CreateBucket to the Action list to create it. (Recommended) Create a new user for Redis for PCF and record its Access Key ID and Secret Access Key, the user credentials. (Recommended) Attach the policy you created to the AWS user account that Redis for PCF will use to access S3. Go to IAM > Policies > Policy Actions > Attach. Navigate to the Ops Manager Installation Dashboard and click the Redis for PCF tile. 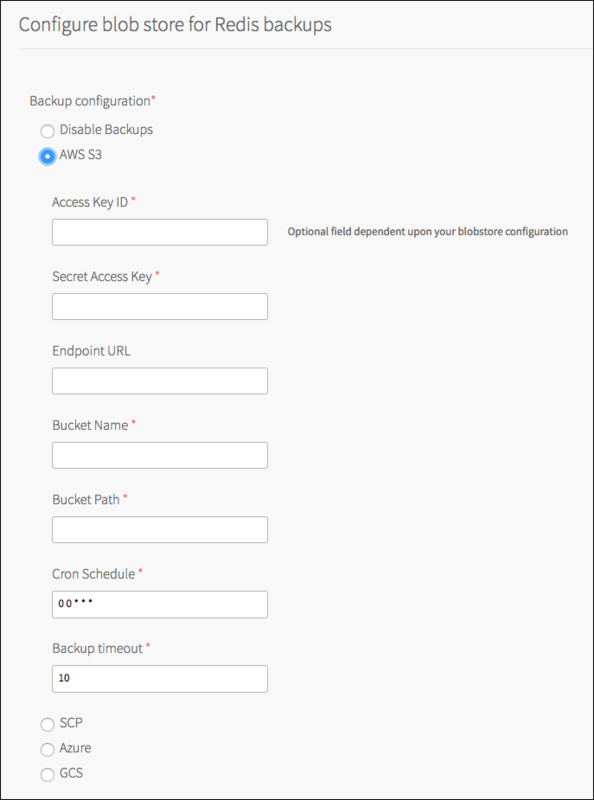 Under Backup configuration, select AWS S3. Redis for PCF accesses a remote host as a user with a private key for authentication. Pivotal recommends that this user and key pair be solely for Redis for PCF. Determine the remote host that you will be using to store backups for Redis for PCF. Ensure that the Redis service instances can access the remote host. Note: Pivotal recommends using a VM outside the PCF deployment for the destination of SCP backups. As a result you might need to enable public IPs for the Redis VMs. Create a new user for Redis for PCF on the destination VM. Create a new public and private key pair for authenticating as the above user on the destination VM. Under Backup configuration, select SCP. Redis for PCF accesses your GCS store through a service account. Pivotal recommends that this account be solely for Redis for PCF. You must apply a minimal policy that lets the user account upload backups to your GCS store. In the GCS console, create a new service account for Redis for PCF: IAM and Admin > Service Accounts > Create Service Account. 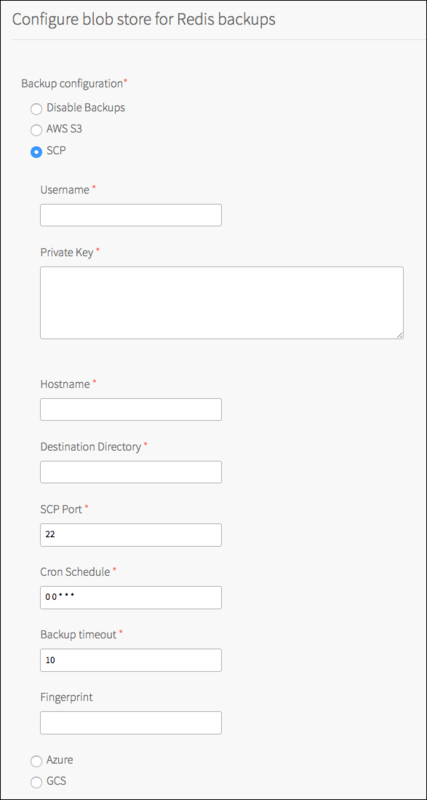 Enter a unique name in the Service account name field, such as Redis-for-PCF. In the Roles dropdown, grant the new service account the Storage Admin role. Select the Furnish a new private key checkbox so that a new key is created and downloaded. Click Create and take note of the name and location of the service account JSON file that is downloaded. Under Backup configuration, select GCS. Under Backup configuration, select Azure. To back up or restore Redis manually, see Manually Backing Up and Restoring Redis for Pivotal Cloud Foundry in the Pivotal Support knowledge base.